We speak regularly with our customers around the world to obtain feedback about our products, our parts supply and our service support. 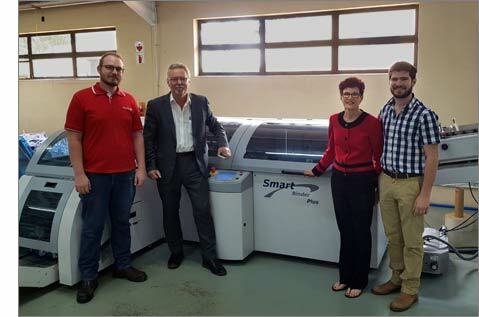 Colourtech Printing in Bapsfontein, South Africa purchased a new Smart-binder a year ago. "We bought our IBIS (Smart-binder) at the end of 2016 and started receiving training on it in the beginning of 2017. All in all the IBIS is a very good machine, usually the more you give it the better it performs in terms of running thousands of books through it 24 hours a day without a hitch. Sometimes problems do pop up, but with all the technical knowledge we have gathered on the machine it can be resolved quickly. Maintaining the machine is also relatively easy. I'm not aware that we have ordered any parts for the IBIS, (but) we do however have lots of spares that came with the machine. To my knowledge, we have only contacted Ipex (Ipex are the local sales agent) twice for help with the IBIS. I like the fact that we can do about 80,000 4 sheet booklets in 24 hours with it, unfortunately the time it takes to fine tune it to run at that speed is quite troublesome. If workload increased to such an extent that we need (to purchase) a second IBIS, then it would be nice, depending on cost. (In summary) the IBIS Smart-binder is a brilliant machine. Throwing large volumes of work at it, usually eats it up as quickly as you can give it. That being said, one needs proper knowledge of the machine to run it at the speeds which our company requires. Working knowledge of the process required to run smoothly cannot be given at training, (but) working with the machine everyday has given me the knowledge I have today in order to keep it going as fast and as efficient as it can go. In short, it's an awesome piece of equipment, but one requires extensive knowledge to run it to its full capacity." This confirms our experience from other customer sites: in the hands of an experienced machine operator the Smart-binder is capable of high volume, high speed, reliable and continuous production. For more information about the Smart-binder and its suitability for your application please contact IBIS.